Partly cloudy. High 62F. Winds SSE at 5 to 10 mph.. Partly cloudy. Low 42F. Winds SSE at 5 to 10 mph. Accepting the donation check was Prairie Winds Elementary PTO President, Heather Twesme. C.B. 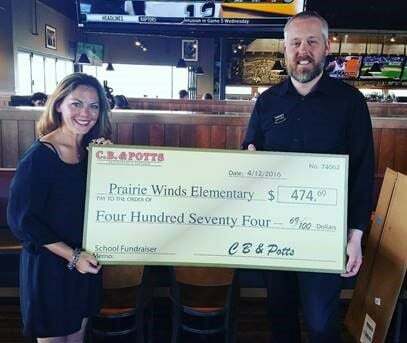 & Potts Restaurant recently donated $474.69 to Prairie Winds Elementary School in Lewis-Palmer School District 38 in Monument, through its Takeover Fundraising Program. Participating schools choose an evening to invite family and friends to dine at C.B. & Potts. Teachers and staff team up with servers to take orders and provide a fun and interactive event. The school receives a percentage of the sales from their event to use for special programs. There are nine C.B. & Potts restaurants in Colorado, including the Colorado Springs location at 261 Kaycee Case Place, near Bass Pro Shops.